Wall Street's trade war anxiety is spreading to tech. Tech stocks suffered their worst day in more than two months on Monday after reports that President Donald Trump plans to crack down on Chinese investment in major technologies in the United States. The Nasdaq dropped 2.1%. Major chip makers including Nvidia (NVDA), Advanced Micro Devices (AMD) and Marvell (MRVL) tumbled more than 4% apiece. Even this year's tech all-stars retreated sharply. Netflix (NFLX) plunged more than 6%, while Twitter (TWTR) and Amazon (AMZN) lost more than 3%. The Dow shed 328 points, or 1.3%, and was down almost 500 points at one point. "The biggest tax involved with tariffs is uncertainty. Everybody freezes," said David Kelly, chief global strategist at JPMorgan Funds. Kelly said that the United States is now working on "trade conflicts on multiple fronts," and failure to reach resolutions could lead to "constant conflict for potentially years to come." Until recently, the tech sector had been mostly spared from the trade worries on Wall Street. The Nasdaq hit a record high as recently as last week. The tech sell-off followed reports that Trump plans to restrict Chinese investment in "industrially significant technology." A person familiar with the plans told CNN on Monday that the measures would include rules that would bar firms with at least 25% Chinese ownership from buying companies involved in technology deemed significant by the White House. Stocks recovered some of their losses late in the day after White House trade adviser Peter Navarro cast doubt on the reports and called the sell-off an overreaction. "There's no plans to impose investment restrictions on any countries that are interfering in any way with our country. This is not the plan," he told CNBC. "So this whole idea that somehow there's gonna be investment restrictions to the world, please, discount that." 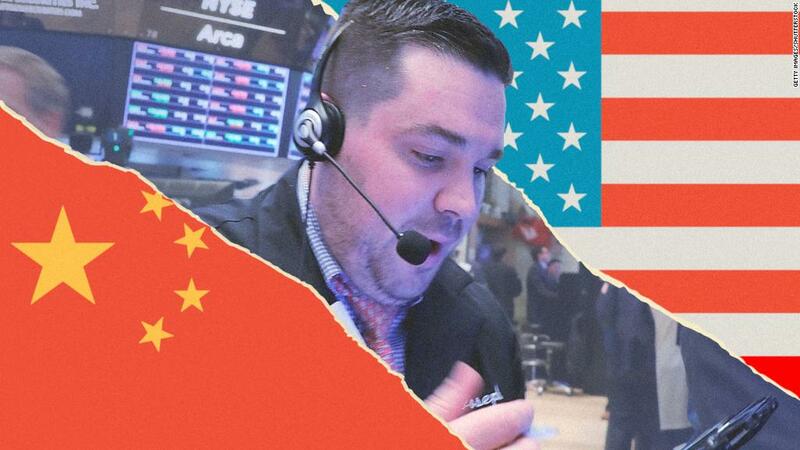 Still, investors fear that Trump's showdown on trade with China and other nations could derail the resurgent US economy by denting business confidence. Bank of America warned in a report on Friday that supply chain disruptions and waning confidence could create a "trade shock" that leads to an "outright recession." While the firm said the odds of a "full blown trade war" are low, the risks are "rising." JPMorgan's Kelly said he's not worried about a recession this year. However, he said "we do know if you add uncertainty to the environment, it will slow the economy." Federal Reserve Chairman Jerome Powell said last week that the central bank is hearing for the first time from businesses about postponed investment, hiring and decision making because of trade worries. "That's a new thing," Powell said. Harley-Davidson (HOG) provided concrete evidence of the fallout from Trump's trade agenda. The motorcycle maker told shareholders it could lose as much as $100 million a year because of retaliatory tariffs from the European Union. The Dow's losses put it close to correction territory, a 10% decline from previous highs. The Dow fell into correction once earlier this year. — CNN's Jethro Mullen and Kevin Liptak contributed to this report.